This table is equipped with height adjustments. It is an advance table which provides efficiency in autopsy procedures. The table is Mounted on central supports column. It comes with regulated sprinkler systems for table surface ensuring continues self-cleaning. It has reverse-flow Hydro aspirator with built in vaccum breaker. Electro Hydraulic Autopsy Table has 4 perforated divisions for body support grid plates. It comes with Hand shower. The down-draft ventilation cone system is incorporated for minimization of odors if attached to external ventilation source. 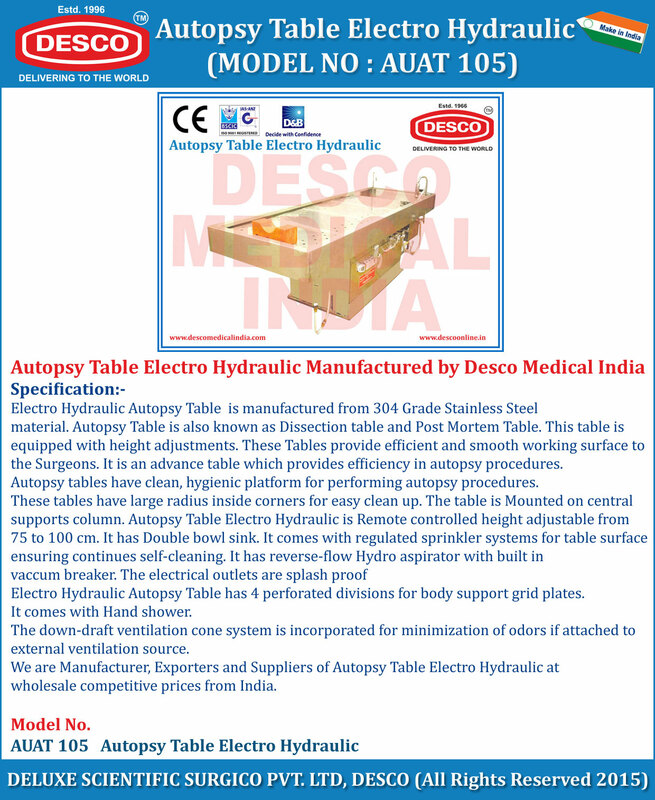 We are Manufacturer, Exporters and Suppliers of Autopsy Table Electro Hydraulic at wholesale competitive prices from India.